The Gathering is, on all accounts, a highly influential band. So I have no regret in saying Mandylion, after 12 years, has stood the test of time and still floors me everytime I hear it, hence making it (at least in my book) a classic. Every CD they release is guaranteed to be drastically different from the previous and just as powerful. Even with their latest offering, 2006’s Home, you look back at Mandylion or Nighttime Birds and just wonder how a band can stay so amazing and so prominent after so long. Mandylion is the first Gathering release featuring Anneke van Giersbergen. Her vocals were perfected in later releases but the raw, almost primal feel she gives off at times on here matches the heavy yet always experimental music the rest of the band has to offer. On a side note, I would buy anything with Anneke’s name on it, she’s just that good, but the band alone is worth the price of admission. Yes, when The Gathering is heavy they’re great but it’s on songs like In Motion #1, Leaves, and Mandylion that they really show what they can do. So for me to say that a band alone is worth buying a CD, I dunno, it just doesn’t happen that often so I figure it means something. Song selection is spot on throughout. Strange Machines starts off with a bang that doesn’t let up until the final notes are played. Eleanor follows in about the same vein as Strange Machines what with the heaviness, however the drums really catch your ear when you listen to them. In Motion #1 shows the group’s more experimental side off well, seeing the entire band really play off of each other. Leaves is owned by Anneke even though the guitar riffs often sport an epic feel. Fear The Sea sees Anneke pull off some nifty vocals but it’s the one song that doesn’t really fit with the overall outcome. Make no mistake, it’s a great song and serves The Gathering catalog justice but maybe it would’ve fit better on Nighttime Birds? Mandylion is the most experimental track included. From the very beginning you know it’s gonna be an interesting listen and it fulfills that notion completely. Sand & Mercury starts off as a somber song but gains momentum to rival even the greatest tracks offered on the CD. And finally, rounding out the CD we are greeted with my personal favorite, In Motion #2. It basically takes the best aspects of the entire disc and combines them. You’ve got Anneke sounding perfect (you know, the norm), the band moves from light to heavy, and there’s even some strings worked in the mix. As for the bonus disc, highly recommended. If there’s one thing I’ve learned from hearing The Gathering over the years (and especially after hearing 2005’s Accessories: Rarities & B-Sides) it’s to expect the demos to have as much, if not more, passion than the original. Make no mistake, the originals usually shine brighter than the demos but hearing the rough versions makes you appreciate the final product that much more. Special mention goes to Solar Glider…amazing. My favorite songs are Strange Machines, In Motion #1 & 2, Leaves, and Sand & Mercury. For Anneke making such a strong vocal debut with the band on Mandylion it’s hard to believe she only gets better with each passing CD. However, Mandylion is a fine start for any newcomer and without a doubt is sure to go down as a classic by any means. Mandylion was the beginning of the new sound for the Gathering. The mix of hard rock guitars, textured keyboard layers and beautiful female vocals is amazing. Although about 13 years old this album is an equal to new albums like Within Temptations The Heart of Everything and Lacuna Coils Karmacode and Comalies. Lacuna Coil was the first band I discovered in this mostly European Genre. The songs Strange Machines and Eleanor are very powerful and remind me alot of Within Temptation. In Motion #1 reminds me more of early Lacuna Coil. Sand And Mercury has a similar sound to some of the material on the Anti-M CD Damage (check the songs Rage and Damage in the Dream if you have itunes). But overall the album is unique and doesn’t sound “like” any other band. Mandylion is a good entry album for someone who has never listened to them before. If you like this album Nighttime birds is a good second choice. Another band of interest would be Nightwish. A little more symphonic metal than the gathering but the album Once is quite good (check songs Siren and Nemo). Mandylion is by far one of their best. The Gathering’s third album Mandylion is the first with singer Anneke Van Giersbergen. The album does not retain the growls from the first album, nor the more nasal male voice along with the ethereal female voice from Almost A Dance. Instead we get consistent solid vocal work along with the already powerful instrumentation that was on the previous records. The music on this album works best as a whole, with the instruments taking a back seat allowing Anneke to be the focus. The guitars, bass, and drums are not overly difficult and they meld well with one another as well as Anneke. Mandylion was the first step in a long lasting relationship between the band and their new found siren. Nighttime Birds (Deluxe Re-issue)continued this evolution of the band and built upon the foundation they created here. 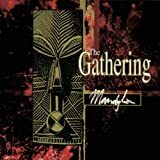 I highly recommend the album, The Gathering made powerful female fronted metal long ago that still holds up to this day.